As time winds down on the urban home goods swap, I knew I had to decide on a plan for my partner. I spent a few minutes at borders book store while waiting for Sophia to get out of preschool. I picked up these goodies. My Inspiration could not be limited to just one book (that's what I told my husband for explaining my 80.00 book purchase, after I had told him I just went for one. ) The Patchwork Style book was where I got the idea or my swap partner. A Kitchen floor mat. The concept is stack quilting, or similair to a ticker tape style of quilting. 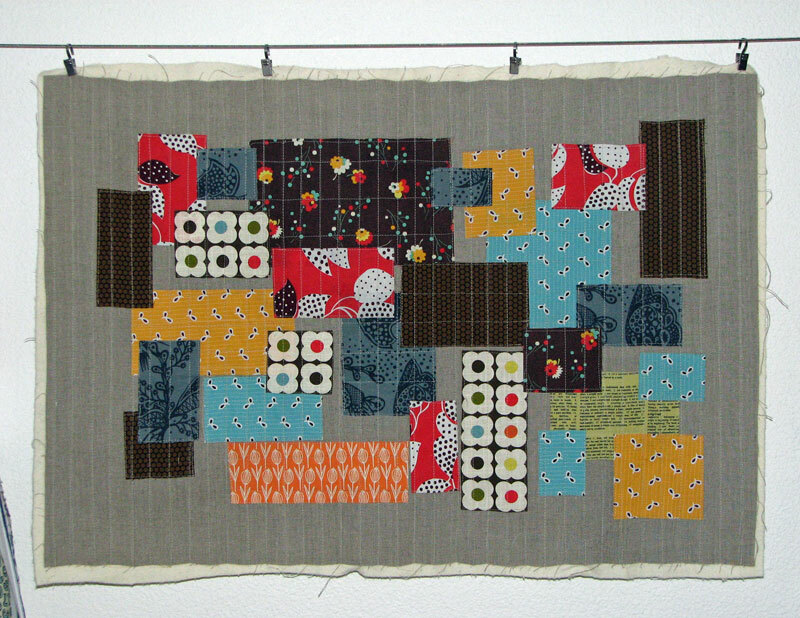 Arranging various fabrics in layers and quilting large peices in one direction, and the smaller pieces in another. At first glance it almost looks like a checkerboard in some spots. 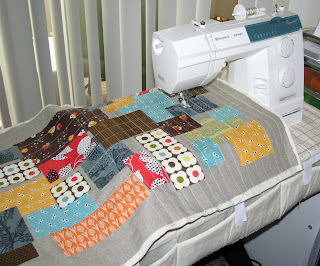 Since it does get used as a rug, I love this idea because as it gets used and soiled, you can just add another favorite fabric over the stain quilt it down and it's a brand new rug. 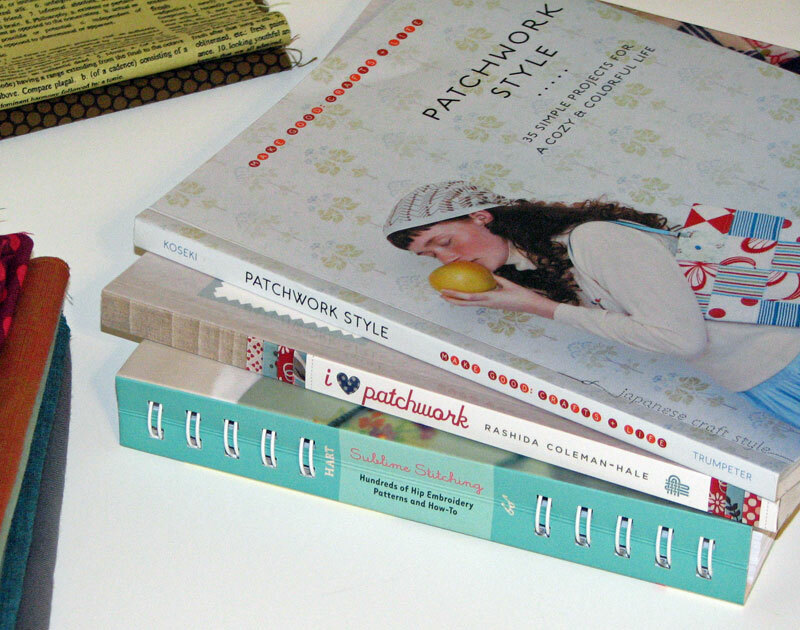 Perfect for the patchwork lover, and changes over time as you keep adding patches.. I have a few more cool ideas coming that are not in these books, but were in fact inspired by them. I will share soon. What do you think? Do you like the concept? Would you dare actually use this a a rug? That is amazing. I probably wouldn't dare use it as a rug just because I have two under two! So pretty! I love all that Fmf with the Orla. And you know, if you join the Borders club they send out coupons for 40% off all the time! OMG... it's a perfect piece of art, that would look SO good hanging on the wall. I sew want to do this! You make it sound easy! Thanks for the sweet pics! love the idea. Nice rug. I love it--and would definitely use it as a rug! I love the idea of this; I love the look of this! BUT -- if anyone sets one toe on that gorgeous piece of art, they will promptly be issued a citation by the quilt/fabric police! No nasty footprints or spaghetti sauce splatters for this beauty! I would totally use it! I wonder how it would work to quilt terry cloth on the back for extra-absorbability (is that a word?). A guild member once made a beach blanket and used old towels for batting under her patchwork, which I thought was a brilliant idea, so I think it's do-able. Love it and would love to say I'd use it as a rug but I doubt I'd be able to bring myself to! I would totally love to use this as a rug! Great idea! You could add extra batting to make it thicker if needed and the fact that it's washable is a plus. Good idea!